The celebration is on for the Flyers at midfield after advancing to their second straight NYSCHSAA Final. The Flyers have, in fact, faced much stiffer competition this season, as opposing teams have played with more of an edge, eager to take down the reigning state champs. However, this perseverant group has been up to the challenge. The Flyers have passed some difficult tests during this 2016 campaign, including their 2-1 triumph last night over Fordham Prep, the champions of the Diocese of New York. The Flyers certainly have a flare for the dramatic and, after surviving an overtime thriller for the third straight game this postseason, Chaminade’s varsity squad will play in their second state championship game in as many seasons. The Flyers and Rams observe the singing of the national anthem prior to kickoff. 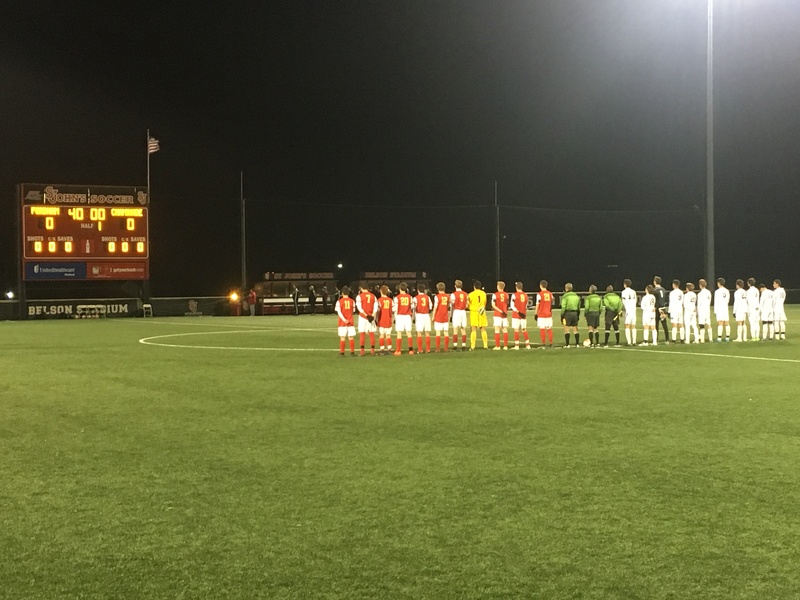 On a cold, windy night at Belson Stadium on the campus of St. John’s University, Chaminade got off to the start they wanted against the Rams, who carried a 16-0-0 record into this semifinal clash. Just two minutes into the game, Vowinkel, a Gatorade All American last season, gave Chaminade an early lead. After receiving a pass from A.J. Codispoti ’17, he weaved his way through the opposing defense, sprinted past the keeper and calmly placed the ball in the back of the net to put the Flyers in front 1-0. Fordham Prep seemed to lack the speed and offensive firepower of the Flyers. After Vowinkel’s early strike, the Flyers began to dominate in possession of the ball. The Rams rarely crossed the midfield stripe, as the Flyers continued to apply intense pressure in their opponent’s end of the field. Codispoti, who was moved by Head Coach Mr. Michael Gallagher from fullback to striker for the playoffs, proved difficult for Fordham Prep to contain. He carved up defenders all night long and continuously created scoring opportunities for teammates with his pinpoint passing. He would get his own chance in front of the goal in the 40th minute, but the keeper, at point-blank range, saved Codispoti’s left- footed strike. Just before halftime, however, the Rams surprised the Flyers defense with a counterattack. The ball was played towards the right-corner flag and was crossed into the 18-yard box, where it found a Rams striker who rifled a shot into the side netting past the outstretched right hand of Flyers goalkeeper Yanni Rigos ’17. The Rams had now suddenly seized the game’s momentum, and the equalizer would set the stage for an exciting, back-and-forth second half. After the halftime break, Fordham Prep, with a newly discovered confidence on offense, was the team that deployed the early high-pressure attack. The Chaminade back line had to fend off a series of crosses from the wings, which proved difficult to defend because of the gusting wind. After surviving this offensive barrage from the Rams, it was Chaminade’s turn to attack once again. Unfortunately, however, the Flyers could not deliver the knockout punch. In the 65th minute, Codispoti found a wide open Vowinkel with a cross inside of the six-yard box. However, the captain uncharacteristically seemed to lose his composure, and his one-time hit sailed wide left. The Flyers organize themselves in preparation for a Fordham Prep corner kick. In the waning moments of regular time, Chaminade had a golden opportunity to finish off the resilient Rams. The Fordham goalkeeper had slipped in an attempt to defend a low cross, and midfielder Alec Brutschin ’17 found himself staring down a wide open net. 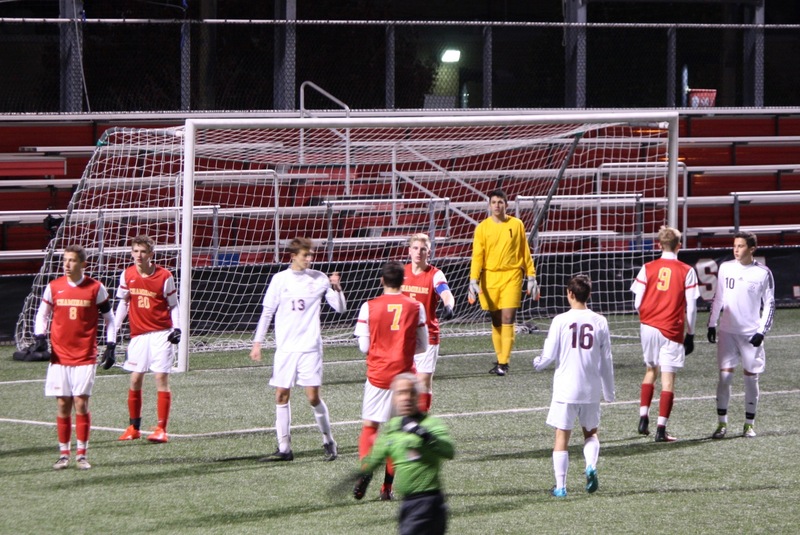 However, a Rams defender made a desperate lunge and took the senior’s shot off his chest to preserve the 1-1 tie. The game would now have to end in dramatic fashion, as the two teams were headed to a 10-minute, golden goal extra time period. However, there was no panic from the experienced, battle-tested Flyers. Just as it has continuously done on this magical two year run, the team found a way to win. Five minutes into the overtime period, Jack Nuttall ’17 was fouled 40 yards from goal. The senior midfielder then lofted a free kick into the 18-yard box, where the ball was headed by Vowinkel, and it settled at the foot of Tim Davis. The senior then poked a shot past the diving Rams goalkeeper and rushed to midfield to celebrate with his elated teammates. Thus the Flyers find themselves in a familiar place – one win away from earning another New York State crown. Tomorrow’s state final will feature two familiar foes, as Chaminade will square off against the Canisius Crusaders from Buffalo in a rematch of last year’s championship game. Chaminade’s varsity soccer team will have to survive its greatest challenge yet, as the Crusaders will be yearning to enact some measure of revenge for last year’s stinging defeat. The 2015 season was a downhill sprint for Chaminade, but this year has been a fun and exciting uphill climb. Can the Flyers finally reach the summit? Win or lose, we know one thing for certain: this team will do it with style. Posted in Sports and tagged championship, soccer, varsity soccer. Bookmark the permalink.